As you hold on to the last few weeks of summer weather, embrace your outdoor space! Use these 5 tips to transform your outdoor living space into a tranquil, serene oasis that is staycation worthy. 1. Add green leafy plants. Nothing says “zen garden” like luscious, green plants. Consider mixing large planters with plants placed directly in the ground to add height and texture to your space. Of course, be certain to choose plants that will thrive in your climate. 2. Incorporate elements of stone and wood. Mixing stone and wood elements brings balance and warmth to an outdoor space. Get creative with how you place these elements, incorporating them in the actual structure of the space (walls), floors, furniture and accessories. 3. Add a water feature. Whether your landscaping includes a swimming pool or you look to add a waterfall feature, incorporating a water feature into a space adds to ambiance. 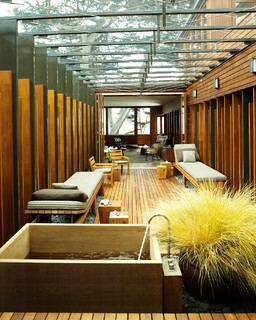 At night-time, include floating candles or lanterns to create a spa-like glow that will have you relaxing in no time. 4. Incorporate a fireplace or firepit. 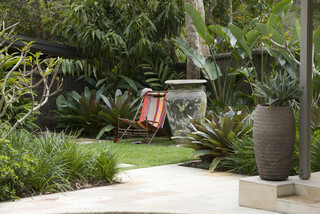 The crackle and sizzle of a fireplace can be used as a focal point in your landscape design. 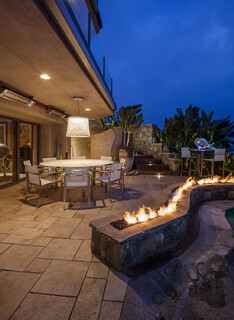 Whether you choose a traditional stone fireplace or a modern rock fire feature, the nighttime ambiance and glow evokes relaxation. 5. Add comfortable furniture and pillows. 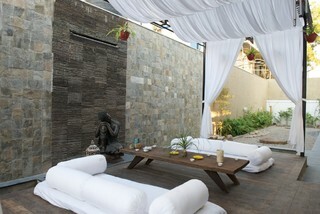 Functional outdoor furniture can make your space both livable and relaxing. Whether you choose to entertain or just relax in your new outdoor space, dining tables, outdoor sofas and chairs and chaise lounges should be on your list.